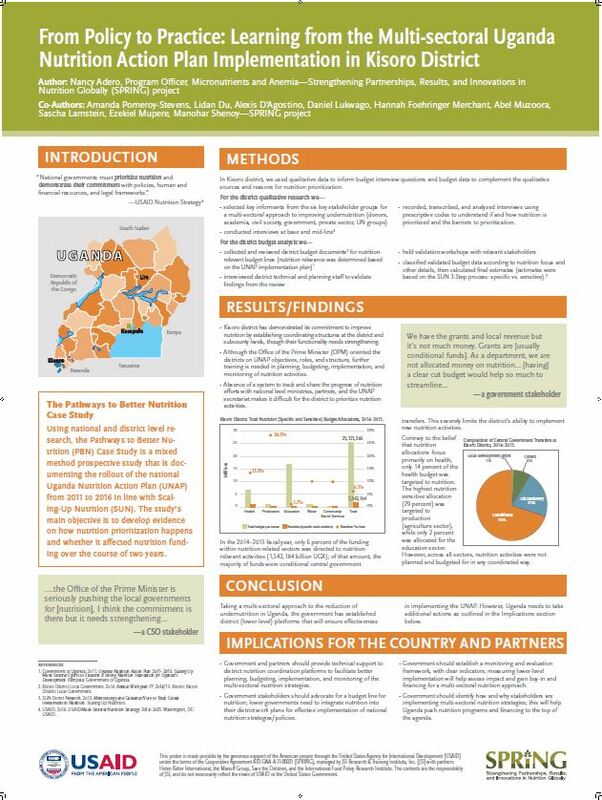 Methods: In Kisoro district, we used qualitative data to inform budget interview questions and budget data to complement the qualitative sources and reasons for nutrition prioritization. recorded, transcribed, and analyzed interviews using prescriptive codes to understand if and how nutrition is prioritized and the barriers to prioritization. Kisoro district has demonstrated its commitment to improve nutrition by establishing coordinating structures at the district and subcounty levels, though their functionality needs strengthening. Although the Office of the Prime Minister (OPM) oriented the districts on UNAP objectives, roles, and structure, further training is needed in planning, budgeting, implementation, and monitoring of nutrition activities. Absence of a system to track and share the progress of nutrition efforts with national level ministries, partners, and the UNAP secretariat makes it difficult for the district to prioritize nutrition activities. In the 2014–2015 fiscal year, only 6 percent of the funding within nutrition-related sectors was directed to nutrition-relevant activities (1,542,184 billion UGX); of that amount, the majority of funds were conditional central government transfers. This severely limits the district’s ability to implement new nutrition activities. Contrary to the belief that nutrition allocations focus primarily on health, only 14 percent of the health budget was targeted to nutrition. The highest nutrition-sensitive allocation (29 percent) was targeted to production (agriculture sector), while only 2 percent was allocated for the education sector. However, across all sectors, nutrition activities were not planned and budgeted for in any coordinated way. Conclusion: Taking a multi-sectoral approach to the reduction of undernutrition in Uganda, the government has established district (lower-level) platforms that will ensure effectiveness in implementing the UNAP. However, Uganda needs to take additional actions as outlined in the Implications section below. Government and partners should provide technical support to district nutrition coordination platforms to facilitate better planning, budgeting, implementation, and monitoring of the multi-sectoral nutrition strategies. Government stakeholders should advocate for a budget line for nutrition; lower governments need to integrate nutrition into their district work plans for effective implementation of national nutrition strategies/policies. Government should establish a monitoring and evaluation framework, with clear indicators; measuring lower-level implementation will help assess impact and gain buy-in and financing for a multi-sectoral nutrition approach. Government should identify how and why stakeholders are implementing multi-sectoral nutrition strategies; this will help Uganda push nutrition programs and financing to the top of the agenda. 1. Government of Uganda. 2011. Uganda Nutrition Action Plan 2011–2016: Scaling Up Multi-Sectoral Efforts to Establish a Strong Nutrition Foundation for Uganda’s Development. Kampala: Government of Uganda. 2. Kisoro District Local Government. 2014. Annual Work plan FY 2014/15. Kisoro: Kisoro District Local Government. 3. SUN Donor Network. 2013. Methodology and Guidance Note to Track Global Investments in Nutrition. Scaling Up Nutrition. 4. USAID. 2014. USAID Multi-Sectoral Nutrition Strategy: 2014–2025. Washington, DC: USAID.